When you’re making a game you should be able to distinctly break down the systems that are necessary for the game to be playable from front to back. Some people claim this describes beta, but that term can be used for almost anything now, and most players assume beta means “almost done”, which isn’t necessarily true when you’re feature complete. If, for example, we were talking about “The Witness”, being feature complete would mean a start menu, the ability to quit the game, a traversable 3D environment, the ability to place and play audio logs, and, of course, the framework for functioning line puzzles that can be started and finished. It’s actually a fairly simple game in terms of functionality. Keep in mind that we’re not talking about Feature’s gluttonous brother, Content, which would include 400-something different line puzzles and 3 square kilometers of polished environment. Now, if we look at a game like Darkest Dungeon, oh my goodness. You’ve got the usual start menu/quit functionality, then character info tabs, drag-and-drop functionality, each building in town with a different function, abilities and stats, how does levelling up work, how do afflictions work, diseases, scouting, curio interaction, how does death work, appearance customization, torch light levels, not to mention huge systems like, oh, combat. There’s a ton of things I didn’t mention. A game like Darkest Dungeon is a systems-based nightmare to develop, and they kept adding more (corpses, etc) as they went. That’s not even mentioning content. So when a game is “feature complete”, it’s done with implementing the systems that make that game work. We’re there! Which means we can focus on content and gameplay balance for a couple weeks before we launch. Feels good. Just for reference, I had some pre-production work done before bringing any programmers on board, but in earnest development on this game started in April of 2015, which means we’ve been working on this project for about 10 months. That’s actually quite a short production cycle. So what features did we complete in the last month or two? Story missions are in; you can play through a sequential series of missions that require the player to have the necessary pre-requisites to accomplish the mission. Missions have different results based on the quality of thieves you send. Heists now show all the important information and skills available to your thieves. Thieves can now see and choose whether to take loot they find, which is important to the way that heists function. The quality of loot found in a heist is now tied to the value of that area- information your thieves discover by running stakeouts before a heist. The entire system of awarding XP to thieves so they can rank up and train has been added. Training itself is now functional; thieves can use training points they’ve earned to increase their stats and learn new abilities. You can rename your thieves. You can now see all your finances in a single menu, making it easy to figure out where your costs are coming from. The start menu includes a news panel, which is easy to update during early access. 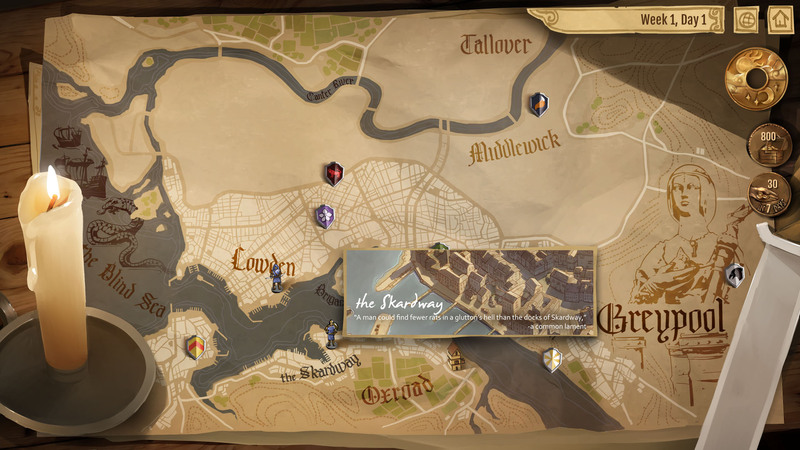 The city/world map now shows all the necessary information for districts in the city and key influential people. This screen was actually the last system we implemented and the only one that still had placeholder art up until this update. Each of the shields represents different factions vying for control in the city, while the thief figurines show where the player has expanded. Mousing over each item reveals pertinent information for that thing. Figurines can be clicked to enter that district where the player finds different missions, buildings will have different values and guard influence. As development continues in early access, more variety will bring rival thieves and other problems to deal with, as well as filling in the streets in the top half of the city as the main story expands. Once again it’s fair to say we’re closing in on a launch date, keep and eye out for future updates! ← What even is this game? Do the thieves themselves decide how they level up(they level up proceduraly like they are created), or does the player choose how his thieves level up? The player makes all the character-leveling choices in the game, same as you would in something like XCOM. Why did you remove the post regarding how gave devs are treated unfairly? There was no one big reason, nobody was complaining to me about it, but when I went back and read it again in the daylight it seemed a bit unnecessary to me and it had little to do with Killers and Thieves. It’s fair to say that I’m still nervous about releasing a game, I think every developer agrees with that, but I don’t want anyone to misinterpret what I wrote out of context some day long from now. I did read all the comments from that post and I appreciate everything people had to share! I see. Sorry if I was rude regarding my opinion towards big developers and their end products (more like 50% unfinished games). I look forward to Killers and Thieves, looks really good. How much customization of your killers and thieves will be available? Are we looking at XCOM:EU/EW or maybe even XCOM 2 levels of detail, or is this something just too much to consider for the resources you have? Unfortunately, customization is one of the harder things for me to add to this game. As a 2D game I’d have to add custom gear for each frame of animation the character can have, which is currently in the hundreds, as opposed to a 3D game where you’d be able to swap out a helmet or shoulderpad and just have it work automatically (for the most part). I know players like customization though, so it may be something worth looking into for future updates, probably more in a fashion similar to Darkest Dungeon where you may be able to choose from different color variations.